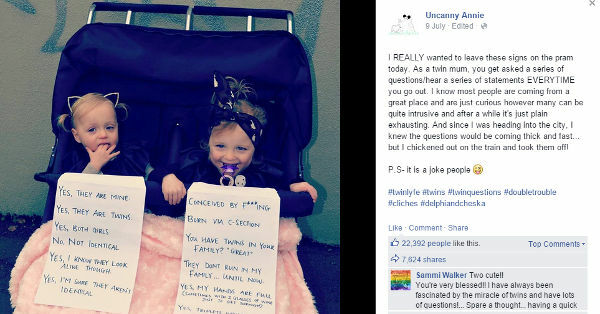 She’s a spirited Australian mum of twins, with a fresh new blog that already has a viral post to its name. But what was meant to be an in-joke between friends has now gone global, and even prompted an apology. 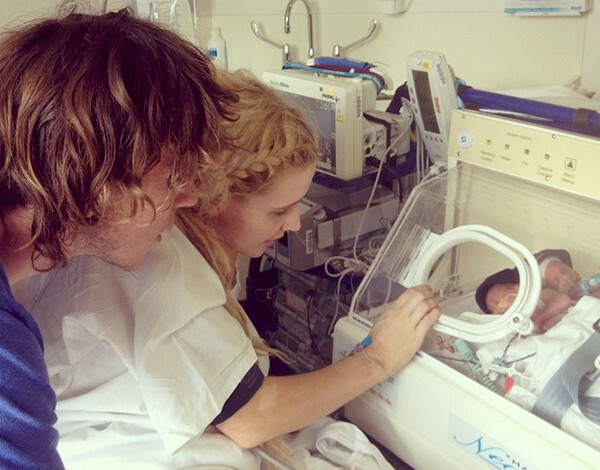 Mum-of-three Annie Nolan thought she’d poke a bit of fun at the constant stream of questions she gets asked by strangers, who are intrigued by Delphi and Cheska, her twin daughters with Western Bulldogs footballer Liam Picken. She penned a couple of giggleworthy signs, attached them to their daughters’ pram, and took a happy snap, which she uploaded onto her Facebook page, Uncanny Annie. Yes, I know they look alike though. You have twins in your family? *great*. They don’t run in my family…until now. Yes, my hands are full (sometimes with two glasses of wine just to get through). Yes, triplets would be harder. Annie then removed the signs and went on her merry way. But as these things tend to do, her post grew legs and went viral. Annie says in follow-up Facebook post, “This photo was staged. I did not actually walk them around like this. It was more “wouldn’t you love to do this somedays?” to parents of twins”. While most comments were supportive, plenty of others haven’t been so kind, prompting an apology of sorts from the 26-year-old for the funny photo, pictured above with Picken and their three children. The pair are engaged and planning a wedding for the end of this year. But Annie isn’t letting the negativity get her down. She’s continuing to plug away on her blog, and maintain a positive attitude to life in general. “I don’t want anyone stressing about me not taking things well. I have lost a brother in a car accident and had twins born at 27 weeks. I also have a friend that was told devistating (sic) news about her daughter having to start chemotherapy again. None of the nasty comments even scratch the surface of what you should take seriously and what you should let upset you,” Annie says.